A native of Cape Town, South Africa, Sarita Uranovsky has enjoyed an exceptionally active and diverse career as soloist, recitalist, chamber musician, orchestral musician and teacher across the globe. She held positions of Concertmaster with Orchestra Geminiani de Fallonica (Italy), the RSAMD (Royal Scottish Academy of Music and Drama) Symphony Orchestra and Assistant Concertmaster of the Cape Symphony Orchestra. 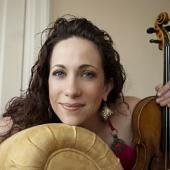 A founding member and violinist of MONTAGE Music Society, she can be heard on Montage Music Society’s “Starry Night Project” released on MSR Classics and has recorded and broadcast for both the BBC and SABC as well as appearing on numerous recordings for BMOP (Boston Modern Orchestra Project) and Parma recordings. Ms. Uranovsky can be heard performing regularly in groups around Boston including Boston Philharmonic, Boston Musica Viva, the Cantata Singers, BMOP, Boston Pops and Emmanuel Music. She performed regularly for Sir Yehudi Menuhin's “Live Music Now!” Scheme while in the United Kingdom and appeared as first violinist of the RSAMD Quartet in concert for HRH Prince Charles, HRH Princess Anne and at the church of St-Martin-in-the-Fields. Ms. Uranovsky is the recipient of numerous awards including the Ellie Marx Memorial and Du Toit van Tonder Scholarships and was silver medalist and University of Natal Prize winner at the SASOL Music Competition (South Africa). She was awarded an Audrey Macklin Bursary (England) from the Associated Board of Royal Schools of Music and won the prestigious Governors Recital Prize at the RSAMD as well as the Ian D Watt and Dunbar Gerber Prizes (Scotland) for violin and piano duo. An avid teacher, Ms. Uranovsky is on the music faculty at Tufts University, the MIT (Massachusetts Institute of Technology) Emerson Scholarship Program and maintains a private teaching studio. She has been on the faculty of the Vianden International Music Festival in Luxembourg and the Saarburg International Music Festival in Germany. Ms. Uranovsky holds an Artist Diploma from Boston University and a Bachelors (with Honors) and Masters (with Distinction)from the Royal Scottish Academy of Music and Drama.